Over recent years, Twitter has demonstrated an expanding role in scientific discussion, surgical news and conferences. 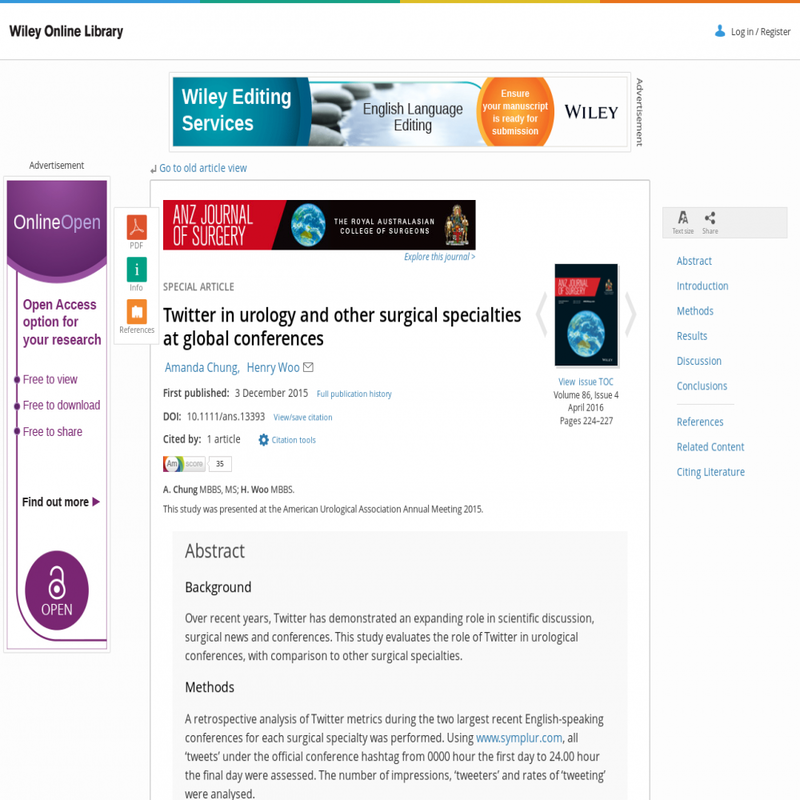 This study evaluates the role of Twitter in urological conferences, with comparison to other surgical specialties. A retrospective analysis of Twitter metrics during the two largest recent English-speaking conferences for each surgical specialty was performed. Using www.symplur.com, all 'tweets' under the official conference hashtag from 0000 hour the first day to 24.00 hour the final day were assessed. The number of impressions, 'tweeters' and rates of 'tweeting' were analysed. Nine of 18 conferences examined had official hashtags registered with Symplur Healthcare Hashtags. Plastic and urological surgery had both major conferences registered. Only one of two conferences for each cardiothoracic, general, orthopaedic, otolaryngology and paediatric was registered. Both major neurosurgical and vascular conferences were unregistered. Urological conferences were associated with significantly more Twitter activity than non-urological surgical conferences in all parameters, with greater than triple the number of impressions, tweets and 'tweeters'. Urological surgical conferences were associated with 337% more tweets and 164% more impressions per conference day, than non-urological surgical conferences. Twitter has been used to supplement surgical conferences. In this regard, the urological community leads the way compared to the remainder of surgical specialty communities.